We’ve been focusing a lot on the high-end spectrum of PC DIY products. Once in a while, it’s also interesting to look at the other end of the spectrum. Especially with the falling pricing of DRAM and NAND, it became even more affordable to build a simple desktop system for office work. 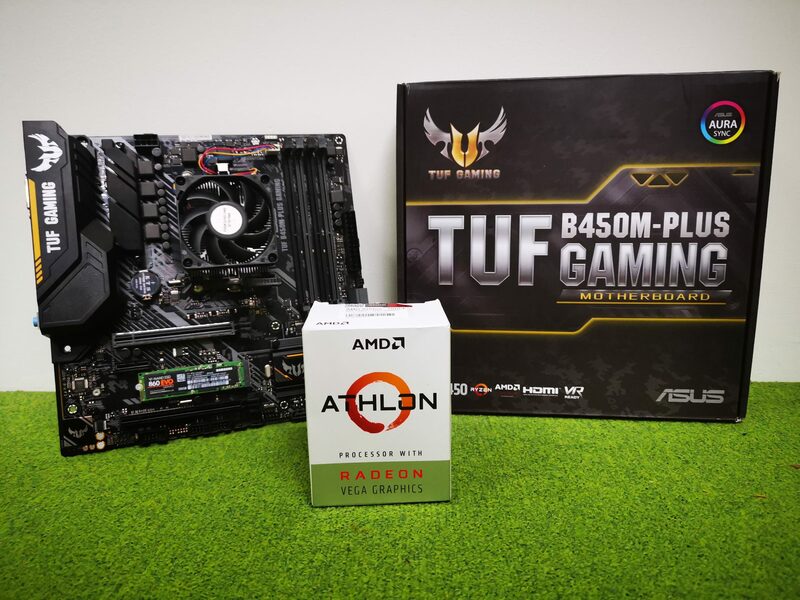 This is why, in this article, we are going to lay our hands on the AMD Athlon 200GE Processor and the ASUS B450M-PLUS Gaming Motherboard to find out how much performance we can get from such a build. How much will it cost? How will it perform? Is it sensible to build such a system? We will find out very soon. Why the AMD Athlon 200GE? The very first PC which I have more than 10 years ago was an AMD Athlon x2 5000+ Brisbane chip. Personally, the Athlon branding had some sentimental value and I was simply just curious to find out how much technology has grown over the past 10 years. But personal reasons aside, the AMD Athlon 200GE seems to really bring some good value on the table as well. This is actually the first Athlon CPU that is equipped with both the AMD “Zen” core, as well as the Radeon “Vega” graphics architecture. Essentially, this would essentially be a APU (Accelerated Processing Unit) with both the CPU and GPU on the same SoC. The new Athlon 200GE still retains to be a entry level dual-core processor variant that support Simultaneous Multithreading (SMT). Comparing to Intel’s offering, it should fall into the same category of the Pentium Gold processors. However, interestingly, the Athlon 200GE also comes with the Vega Graphics processor, which should be able to allow the system to perform better in graphical tests. Based on the CPU benchmark database Passmark (correct as of 2nd December 2018), which tests the performance of CPUs based on the Passmark CPU test, the overall performance of the Intel Pentium Gold G5400, which is currently the cheapest Intel CPU available in the Singapore market, is about 5 to 6% faster than the Athlon 200GE. However, when we compare the retail price of these two processors, the AMD Athlon 200GE definitely shows who’s more affordable. Based on a price check from a Sim Lim Square’s pricelist, the AMD Athlon 200GE retails at S$91, while the Intel Pentium Gold G5400 costs a whooping S$152. Who would actually pay 67% more just for an additional meagre 5% performance increase? Why the ASUS TUF B450M-PLUS GAMING Motherboard? The ASUS TUF B450M-PLUS GAMING motherboard is a no-frills motherboard that has all the features needed for a decent system. Moreover, the TUF Gaming series are added with additional protection to ensure the durability and reliability of the motherboard. For example, its PCI-E x16 slot is equipped with an additional fortifying metal to better support heavy graphics card. There are also Electostatic Discharge protection guards along the LAN Port, Keyboard and Mouse Connectors, DVI Port and USB connectors to prevent any short circuit of the motherboard. This motherboard is also equipped with higher grade components, such as military-grade chokes and MOSFETs to really make sure that the system will run well even after years of use. Although not relevant for our build, as the system that we are going to build is going to be fully covered up, the motherboard also has RGB lighting. It would look complementary to the overall system build if you are building a PC with a transparent side panel. The above prices are gotten from PC Components retailers at Sim Lim Square. In our opinion, a decent computer system must definitely have an SSD. Therefore, we’ve included the Galax V100T for this setup. This is the cheapest SSD available in stores, which will be used to accelerate the our mechanical 1TB hard drive via AMD’s StoreMI software. Also, since the AMD Athlon 200GE only officially supports DDR4 RAM up to 2666MHz, there wasn’t any point for us to purchase RAM of higher speeds as well. In the end, we would have spent S$489 on this build (or even cheaper if you decided to haggle with the shop owners). As we did not want to spend the money to purchase the system mentioned above, we had to simulate the performance of each individual parts. We kept the CPU, Motherboard, Case and PSU the same. As for the RAM, we had a G.Skill Flare X 3200MHz DDR4 RAM 2 x 8GB Kit. Instead of utilizing both speeds, we will be only using 1, and configured the RAM to the 2666MHz with CL 16-18-18 timings. We had the Samsung 850 EVO in place of the Galax V100T, and a Samsung 2TB HDD (5400RPM) instead of the Toshiba 1TB. There will be performance differences, but this setup should provide a good enough comparison for performance. PCMark 10 Extended tests the system on various use cases and gives it a score on how well it performs. For comparison, we also a benchmark record from the PCMark 10 Extended database to find out the Athlon 200GE compares to its Intel counterpart. We had the Pentium G4600 processor for this comparison, as it was the CPU that was the most similar to the Pentium Gold G5400 in terms of performance and availability on the PCMark Extended database. The benchmark really showed off the compute performance of the Intel Pentium, as they were all better than that of the Athlon 200GE. They do bring about better performance when it comes to productivity and digital content creation tasks due to their higher clock speed and better microarchitecture. However, we also took note that this comes at a cost, as the G4600 is rated at a TDP of 51W. Even for the G5400, its TDP is rated at 58W. On the other hand, the Athlon 200GE only has a TDP of 35W. Therefore, we dare not make any assumptions when it comes to compute efficiency with the test. Moreover, the Athlon 200GE also showed that it faired only slightly better in terms of Gaming performance. It was much lower than expected, and with the improved Intel UHD Graphics 610 on the Pentium Gold G5400, the performance could have been overturned. Similarly, for the PassMark test, the system is placed in the 55th Percentile of all systems tested with the benchmark. This really shows that the Athlon 200GE can only produce a rather average performing system. As expected, the actual CPU performance of the AMD Athlon 200GE is rather weak. It only managed to score 357cb on the Cinebench multithreaded benchmark. This is expected, as the Cinebench multithreaded benchmark leans towards processors with many cores and threads. However, when it comes to single core performance, we saw slightly more promising results. The Athlon 200GE had the same score with the Ivy Bridge Intel Core i7-3720QM processor. Nonetheless, the overall CPU performance on both multi-threaded or single-threaded applications are still considerably bad in today’s high computing era. But of course, we must constantly remind ourselves that this processor is not all about performance, but rather if it can perform well in simple daily computing tasks. Due to our budget constraints, we only had the chance to include a single stick of RAM within this build. This means that the memory on our system was only running on single channel, and thus, causing rather poor performance on the AIDA64 memory benchmark. To find out the performance difference between single channel and dual channel memory configuration, we ran the same benchmark again, but this time, with another 8GB stick to enable dual channel memory. The results were apparent. If you had that additional budget, your system, regardless of CPU or any other components, should always run in dual-channel memory configurations. This will really improve the memory performance of the system. Moreover, especially on the Athlon 200GE with Vega graphics, memory speeds can actually affect graphics processing performance as well. This is because the graphics processor on the SoC actually shares memory with the main system, rather than having dedicated video memory. Therefore, it is expected that if you have faster system memory, graphics performance from the Vega chip will also increase. We will do a further analysis on this when we do a comparison on the games in the games benchmark later. Based on the stock performance, the AMD Athlon 200GE and the AMD B450 chipset was able to handle our SATA based M.2 SSD very well. However, with the launch of the 2nd Generation Ryzen processors, AMD also released a new software that enabled hard drive caching with an SSD. For the layman, this technology allows your hard drive to run at SSD speeds. This is enabled by having an SSD to buffer data between the main system memory and the main mechanical hard disk. So, let’s give it a try. With AMD StoreMI, we managed to get the Samsung EVO 850 to act as a cache for our 2TB Samsung Hard Drive. Interestingly, this setup worked very well, as we were able to achieve near SSD speeds on our 2TB volume. Of course, if you are on a budget, you should probably just settle for an SSD with a smaller capacity for a cache. If you are just simply going to let your system run games that are not as graphically intensive, the AMD Athlon 200GE still works. As shown in the results, it was still able to run Street Fighter IV and DOTA 2 adequately. Of course, you get what you pay for. If you are looking for a system that’s going to play anything that’s even slightly more intensive, the Vega 3 graphics simply can’t handle it. Interestingly, we also saw the difference between how dual channel memory affects the performance of games. In fact, we saw performance gains across all game benchmarks when the system ran in dual channel memory configuration. How would we have selected our PC components differently? To even get a better bang for the buck, we would have swapped out the 120GB SSD for a smaller 60GB SSD, as its purpose will only be used as cache for the main hard drive. This would probably save us a few dollars. With the spare change, we could easily change the system from a 1 x 8GB RAM configuration to a 2 x 4GB (I don’t think you can easily find 4GB DDR4 RAM sticks these days) configuration, or even better, a 2 x 8GB configuration to reap the benefits of a dual-channel memory configuration. The AMD Athlon 200GE lands in a very special place of its own. It was able to fit comfortably in a budget-oriented market segment that Intel has yet to lay their hands on, especially for the Singapore market. The price differences between the AMD Athlon 200GE and the next available Intel CPU was simply so far off, that it almost is a no-brainer to choose the AMD Athlon for slightly less performance you would get from the Intel. Coupled with new technologies such as the AMD StoreMI which brings even more sensible performance improvements to the system without the need to spend too much money, AMD technologies really seem to bring a lot of value to buyers. Moreover, just yesterday, Tom’s Hardware reported that the AMD Athlon 200GE can now be overclocked with a new motherboard BIOS update. We’re pretty sure that with some tweaks and overclocks, the AMD Athlon 200GE system can easily perform better than a system based on the Intel Pentium Gold G5400 system. As an entry level desktop CPU, the AMD Athlon 200GE doesn’t do wonders, but it will most definitely handle your day to day applications such as web browsing, word processing, video streaming well. However, when it comes to more CPU or graphics intensive computing, it’s a straight no-no. It simply isn’t designed for those applications. If you had S$150 of dollars more, you could probably look at the Ryzen 5 2400G which should improve both the compute and graphics performance of your system significantly. Regardless, it’s still a wonderful and affordable product, and will be a good fit for many office users. Therefore, we will be giving it our Best Value Award.